Okay, I was watching the Days movie yesterday and except for about one thousand ice cream scenes it was pretty much okay, but I noticed a conversation I never paid much attention to yet. Sadly, I don't remember the day (but I'm trying to find out), the organisation members sat in their respective seats in that seat-gathering room and Xemnas asked Saix whether "the devices are ready" to which Saix gives a positive answer that was something along the lines of "almost". Maybe I'm stupid here or not seeing the most obvious, but I can't recall any instruments that needed preparation so I don't know what he refers to. Does he mean Xion? That would be quite strange since he was clearly talking in plural, so does he mean Roxas and Xion? You don't mind linking the video of the scene so we can get better context? Yes, it was not supposed to gain a mind of its own---nor become the person we see. But in the end, it only proves that the puppet is the more worthy vessel. The time has come. SaÃ¯x, are the devices ready? The problem about the movie is that it doesn't even show the full game - we know exactly what does devices are in the NDS version. Those devices are used by Xion to power herself with different forms and weapons in her boss battle. The devices granted Xion power to eliminate and absorb Roxas through Sora's true memories - Xion uses them by absorbing them. 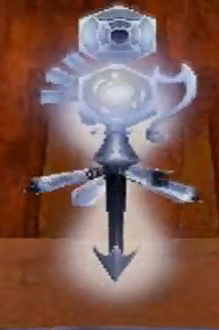 Three of these devices are placed in three worlds that Roxas is transported to during his fight with Xion. The first one is in the Bizarre Room in Wonderland. The second device is in the Manor Ruins of Halloween Town. And the third device is inside the Lamp Chamber in Agrabah. We only saw this one getting placed there during Mission 90 - by Roxas. They're basically memory containers, planted in worlds that Sora had strong memories of. Ah, okay, thanks! I didn't know that because I never played that game too far, the mission and magic system were just too much fun to handle for me. Wow, I didn't know the organisation even placed devices to have Roxas absorbed, I thought that was just something they desired and were pleased when it worked out(even though they didn't expect the extent). Is it possible that there is another one in Castle Oblivion? Xion finds there some glowing orb on some day (I'm so not helpful, I'm really sorry) which makes her question her identity. Could this have been another one of those devices or are they limited to three? No problem, glad I could help!! They're for sure limited to three, since otherwise she would've not only had another form, but we would've fought her in Castle Oblivion, too, then. "Memory containers". Could this be one of the reasons that Xemnas had so much interest in Castle Oblivion? The rooms in CO are meant to emulate memories. To do this, you have to contain them, so it's possible that Xemnas found a way to contain memories by going into CO. And I have the impression that before making an expedition team to research the castle, some people already examined it. And with how the Chamber of Repose seems help Xemnas remember his past, is it possible that the chamber is a recreation of a room from CO? Also, Xion faints such as she enters the castle. Could very well be because the walls of Castle Oblivion store memories, and since Sora was there, there may have possibly been no need to have a memory container in place. Xemnas is so interested in Castle Oblivion because he wants to find Ventus - or, rather, The Chamber of Waking, not because they could somehow emulate memories or so. It's also not really sure yet whether the whole memory-shtick is actually Castle Oblivion's doing, or if it was simply NaminÃ©. Xion faints as she enters the castle, yes. But it's not because of the walls or anything - it's because of either Sora's or Ventus' presence, I can't quite remember. I think it's both Sora and Ventus actually, it would make sense since both experienced so much while they were awake. Also, it's worth noting that the devices that are in each of the 3 aforementioned worlds grant Xion Sora's original abilities (Sonic Blade in wonderland, Ragnarok in Halloween Town and Ars Arcanum in Agrabah) that he used during the original kingdom hearts. Just some food for thought for anyone who didn't know. We never see Roxas planting all of them, so we don't know who planted the others besides the one I mentioned. iirc anyway.